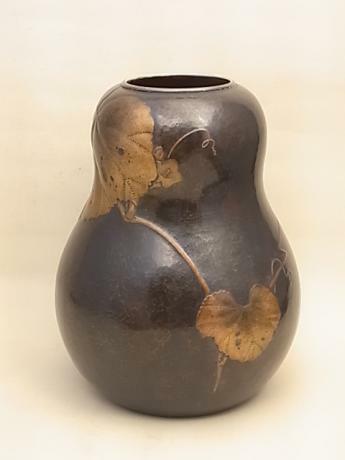 Japanese mid 20th century hand hammered copper gourd shaped vase by GYOKUSENDO. The vase is done with a vine design, with the leaves and vines done in a lighter metal color. The vase measures 9 3/4" tall and 7 1/2" in diameter. The vase comes with TOMOBAKO, or original artist signed wooden stor..
Japanese early 20th century pure silver vase by SHOZAN. The vase has the design of KOI swimming around the sides and done in different colors of silver. 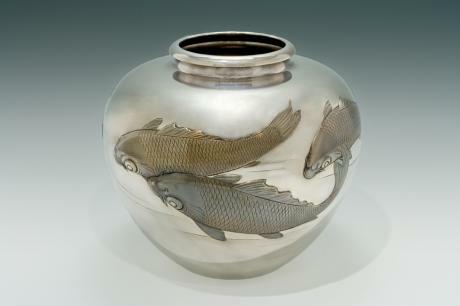 The vase is signed SHOZAN and is stamped JUNGIN, or pure silver on the bottom. The vase comes with wooden storage box. 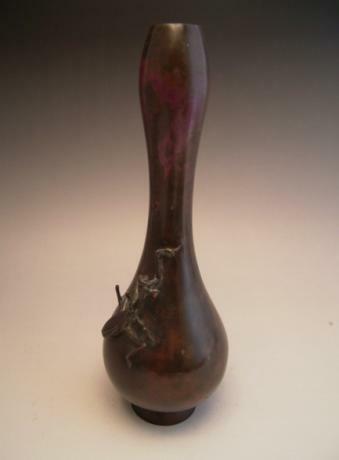 The vase measures 8 1/..
Japanese 20th Century bronze vase with praying mantis done in refief. There is an artist's stamp on the bottom, however it is illegible. No storage box. The vase measures 8 1/2" tall and 3" wide at the widest. 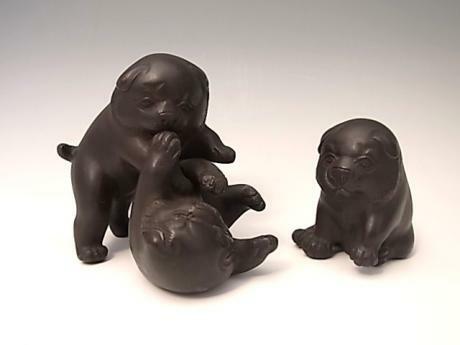 Japanese early 20th century bronze trio of puppies. Two puppies are playing together while the third one watches. The trio is signed by the artist on the bottom of the pair of puppies and not on the single puppy. The expressions of all 3 puppies are very similar so it is obvious that both piece..
Japanese early to mid 20th century glass vase by glass master IWATA TOSHICHI (1893 - 1980). The pioneer of Japanese art glass. Iwata graduated from Tokyo Geidai University, the prestigious art school. He was also a teacher of another glass master, FUJITA KYOHEI. His pieces are in the Metropoli..
Japanese 20th century art glass vase by master glass artist, HISATOSHI IWATA. 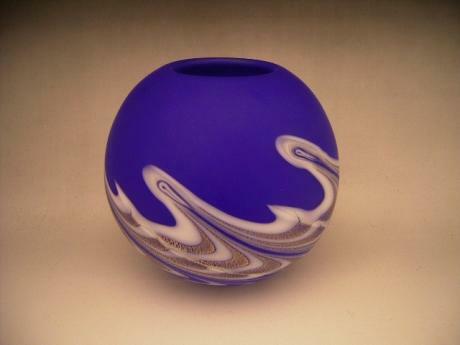 The beautiful handblown vase is done in a round shape in blue, white and gold glass. It is entitled NAMI, or waves. Hisatoshi Iwata was born in Tokyo in 1925 and he died in 1994. He graduated from the prestigious Tokyo..
Japanese Edo Period pair of wooden carvings of Monju and Fugen Bosatsu. The pair is dated 1699, and although there is some age to the pair, they were most likely made later. 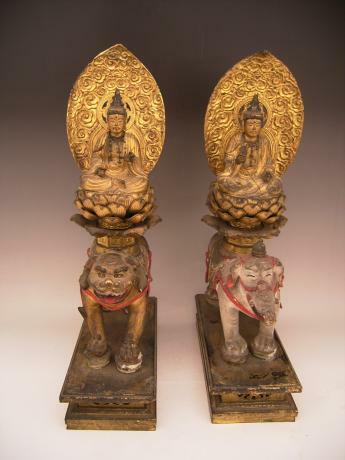 In the legend of Monju and Fugen, these two are princes of Amida Nyorai, Monju, an elder brother, rides a Shishi( historic..
Japanese mid 19th century Buddhist Senjyu Kannon, Goddess of Mercy with 1,000 arms, with case. The sculpture is beautifully carved and painted in wonderful detail. 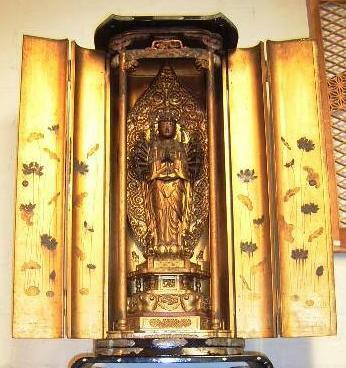 The Goddess and the inside are covered in gold leaf and the outside is done in black lacquer. The Goddess measures 15 1/2" tall. 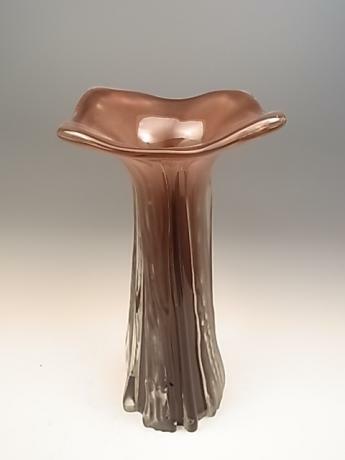 T..
Japanese 20th century art glass vase by master glass artist, KYOUHEI FUJITA. 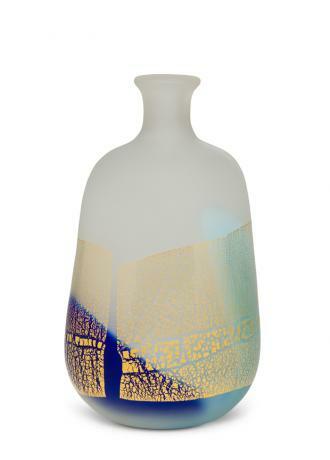 The beautiful handblown vase has a blue and gold colored design. KYOUHEI FUJITA was exhibited at the New York Metropolitan Museum of Art. There is also a KYOUHEI FUJITA museum in Matsushima, Japan. 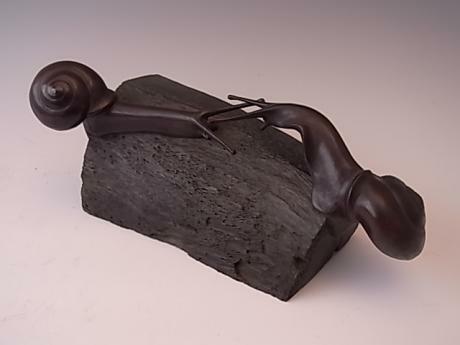 The vase measures ..
Japanese 20th-21st century leather snail Okimono by artist Kono Ko. Kono Ko was born in 1956 in Ehime Prefecture. He studied painting at Kyoto Saga Art University and graduated in 1977. In 1984 he became independent and opened his own studio in Kyoto. His works are in the permanent collections..